The two big surprises of the 2016 presidential race so far are Bernie Sanders and Donald Trump. Two dark horse candidates opposed by party insiders, each began a substantial surge in campaign polls around the beginning of July. In Real Clear Politics‘ average of polls, Sanders has gone from 12.7 percent to 25.0 percent since July 1, while Trump has gone from 6 percent to 22 percent. Yet corporate media show a fascination with just one of these characters. Is it the self-described socialist senator from Vermont, who has focused his campaign on combating the US’s rising inequality? Or is it the billionaire real-estate developer who blames America’s economic troubles on foreigners and calls for massive deportations? Unsurprisingly, corporate media are mainly interested in Cinderella stories when they don’t question the wealth of the class that owns and advertises in media outlets. We used the Nexis database to see how often various news outlets had mentioned Sanders and Trump since July 1. 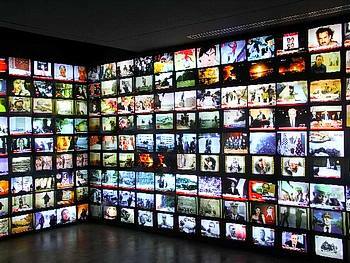 The biggest gap we found was in the medium that reaches the most voters: broadcast network TV. On average, ABC, CBS and NBC named Sanders in their news stories 17 percent as often as they named Trump–roughly one story that included the senator for every six with the developer. Leading newspapers–the New York Times, Washington Post, Wall Street Journal, LA Times and USA Today–ran three times as many Trump stories as Sanders stories: Sanders was mentioned 34 percent as often as Trump in these papers. (The Journal‘s articles are available as abstracts, not full text, on Nexis.) The New York Times had the highest ratio of Sanders to Trump mentions, at 49 percent; the Journal had the lowest, with 22 percent. All the cable news channels talked about Trump more often than Sanders–even MSNBC, which often caters to a progressive audience. MSNBC did come closest to parity of any outlet we looked at, however, with 67 percent as many Sanders as Trump stories. 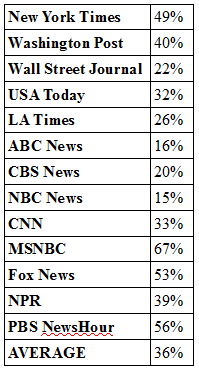 Fox News also had relatively frequent references to Sanders, 53 percent as many as its Trump references. CNN was the most Trump-heavy of the cable networks, mentioning Sanders only 33 percent as often. Overall, cable news referred to Sanders an average of 51 percent as often as Trump. Public broadcasting didn’t pay more attention to Sanders than did for-profit cable. OnNPR, Sanders came up 39 percent as often as Trump on NPR, and 56 percent as frequently on PBS NewsHour–averaging to 48 percent. On average, the 13 outlets we surveyed had 36 percent as many references to Sanders as to Trump. While these candidates are backed by roughly as many voters in their own parties, among the general public Sanders is far more popular; in recent polls, 59 percent express a negative opinion of Trump, with about half as many liking him, whereas Sanders is one of the rare politicians who is viewed more often favorably than unfavorably. On the rare occasions when pollsters match up Republican hopefuls with anyone besides Clinton, Sanders trumps Trump. So why should news outlets think voters need to hear about Trump about three times as often as they hear about Sanders?